Maybe it’s the school buses that now fill the streets on our daily commutes or the school buildings swarming with kids, but this time of year has us feeling a bit nostalgic. Thinking back to our own school days, we can’t help but reminisce about the school lunches that fueled our childhoods. The snacks were always the best parts: We cherished those Swiss roll cakes and little bags of chips that served as classic sides to our Lunchables, sandwiches, or whatever was left over from dinner the night before. While chips might have made up much of our childhood diets and after-school snacks, their job does not have to end in adulthood. Whether you are feeling nostalgic, too, or just craving the crunchy snack, we found several dishes around Baton Rouge that feature chips big and small. This sushi roll is made with salmon, cream cheese and avocado and then rolled in—wait for it—Dorito’s nacho-cheese chips. Equally outrageous as it is enticing, Tsunami‘s Munchie Roll will surely fill your chip cravings. While District Donuts Sliders Brew is known for its adventurous flavors, its Late-Night Snack doughnut is on another level. Topped with a vanilla bean glaze, caramel drizzle and chocolate-coated potato chips, this snack is acceptable to eat anytime of the day. There is nothing better than traditional street corn … that is until you try Popaletas’ street corn with a twist. The corn is topped with butter, cheese, mayo and then loaded with the crumbs of Flamin’ Hot Cheetos. A bonus? This spicy snack goes perfect with one of their fresh drinks and popsicles, which you can read more about here in our 225 Dine feature. 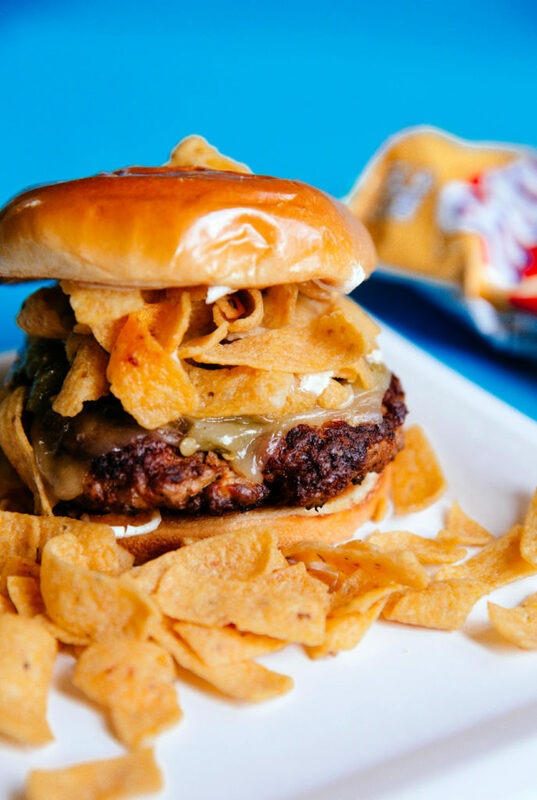 This limited-edition burger is stacked high with roasted hatch chile pork, pepper jack cheese, green chilies, corn chips and cremá. While this burger is only around for a short amount of time, Curbside incorporates corn chips in their burgers frequently, so be on the lookout for other burger concoctions. Look, we know that this is less of a chip-inspired dish and more of a chip-only dish, but we couldn’t not add it. A dish loaded with Bistro Byronz‘s homemade chips, drizzled with creamy blue cheese and topped with blue cheese crumbles is a dish that will make our list any day. A true American classic, a Frito chili pie from Frankie’s Dawg House will not disappoint. While you are there, you can follow that crunchy goodness with one of its specialty hot dogs or sweet snoballs.